October 2009's top seller was DC's Blackest Night #4, with first-month orders of 136,100 copies copies. By the end of the year, it would have orders of more than 140,200 copies, making it the eighth-best-selling comic book of 2009. Blackest Night helped DC take the top six slots on the chart for what was likely the first time since 1968. But it was a down month overall. There was a particularly steep drop of 30% in dollar orders for the Top 100 Trade Paperbacks; DC had Watchmen and a heavily ordered Joker hardcover in October 2008. Comparatives were tough on the comics side, too, with issues of Secret Invasion and Final Crisis topping the charts in the previous year. Check out the detailed analysis of the month's sales here — and sales chart here. 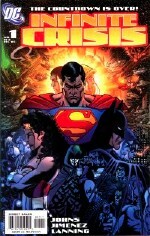 October 2005's top-seller was huge: DC's Infinite Crisis #1 moved nearly a quarter million copies in its first month. Reorder months that also charted would put its total higher than 270,000 copies, making it the 10th best-selling comic book of the 2000s. (See the whole list here.) The month was up 4% in overall dollars over the same month in 2004. Check out the sales chart for October 2005 here. 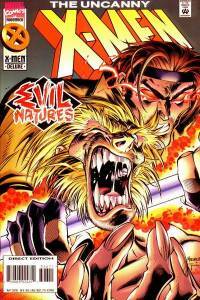 October 2000's top-seller in preorders was Marvel's Uncanny X-Men #387, with Diamond preorders of 113,700 copies; it didn't make the Top 300 list for the decade. But, again, while reorders weren't reported at the time, the release with the most momentum was certainly Ultimate Spider-Man. Issue #2's preorders were 47,000 copies, putting it in 18th place, but reorders certainly would have placed it higher, had they been reported. The title didn't really begin to move in initial orders until December. Otherwise, it was a pretty blah month, with no major launches. Check out the sales chart here. October 1995 finally brings us to the end of Capital City Distribution's unit sales reports, which had begun more than a decade earlier. While it had ceased to distribute Marvel comics after July 1995 due to Heroes World's exclusive and DC comics after September 1995 due to Diamond's exclusive, Capital City polled its retailers in July, August, September, and October on what they'd sold. In October, it found X-Men Vol. 2, #47 at the top of the list; the title very likely outsold the top-seller at Diamond, Spawn #37. Check out Diamond's sales charts for October 1995. Capital sold 50,150 copies of Spawn #37, a large drop from when Capital was a full-line distributor: Image had been announced as a Diamond exclusive by this point, and retailers were already placing orders with Diamond for Image's December-shipping titles in October. Dark Horse went exclusive with Diamond as of November-shipping titles. In its November retail publication, Capital City replaced its unit sales table with a dollar sales table that included all of its products, not just comics. All Diamond charts from 1995 and early 1996 have been added to the website; read more about it here. October 1990's top seller at Diamond and Capital City was Todd McFarlane's Spider-Man #5. Marvel sold 587,500 copies of the issue through all channels, including 507,400 copies in the Direct Market (including 143,400 through Capital). October 1985's top seller at Capital City was Marvel's X-Factor #1, with orders of 77,800 copies through Capital; overall sales were likely north of 400,000 copies. Secret Wars II crossovers were also continuing to appear in many Marvel titles; Uncanny X-Men #232 was one, ranking as the second-place title. 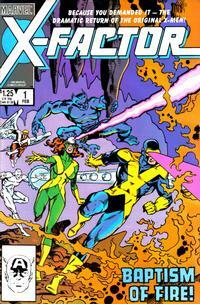 Crisis on Infinite Earths, nearing its conclusion, saw its 11th issue place fourth. The big buzz of the month, though, was that John Byrne — the force behind X-Factor #1 — would be taking over Superman in 1986; the reboot ultimately made a huge difference to Superman's sales.